Polar bears are intimidating predators found in the northern Arctic, listed as “threatened” by the Endangered Species Act in 2008. They are used to sub-zero temperatures and brutal weather, and have developed a number of coping mechanisms for dealing with harsh cold. For instance, polar bears can slow their metabolism when food is running low. 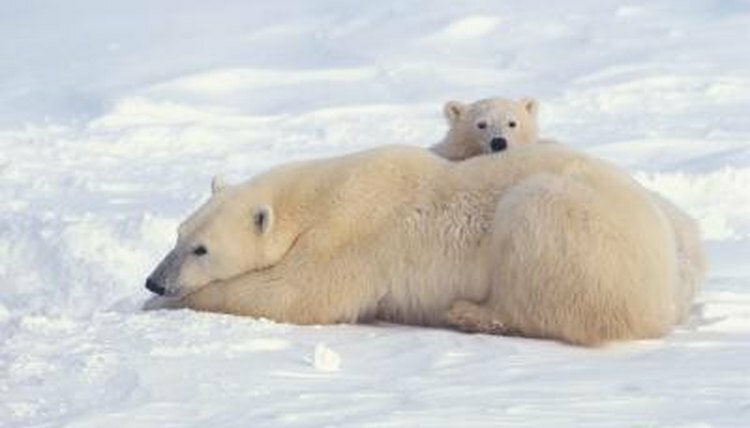 Though polar bears are quite hardy, occasions do arise in which they need to take shelter. Polar bears aren’t like other bears, however, and rarely hibernate in caves. Polar bears live in the Arctic and exist in the United States, Canada, Greenland, Norway and Russia. Conditions in the Arctic are tough, with temperatures plunging as low as minus 40 degrees Fahrenheit. Polar bears subsist primarily on a diet of seals, though they have been known to eat other animals and even other polar bears as opportunities arise. Polar bears have a thick layer of blubber that helps them stay warm, along with special transparent, heat-trapping fur that draws warmth from the sun down to their skin. For the most part, polar bears are well equipped for harsh weather. They walk, swim and sleep in sub-zero temperatures without much fuss. However, if a particularly nasty storm rolls through or weather gets extreme, polar bears will dig out small snow dens and curl up in them to keep warm. On the other side of the thermometer, bears in the southern, warmer areas of the Arctic may take to the water to avoid overheating; bears are much more sensitive to heat than to cold. Polar bears have lived for over 200,000 years in the Arctic by adapting to the weather. Unlike other bears, polar bears do not spend time hibernating in the winter. Instead, they do what is known as “walking hibernation,” in which they are still awake, hunting and exploring, but with a much lower metabolic rate. Female polar bears will den for several months while pregnant and following the birth of cubs, but once the young bears are ready to step out into the cold, the den is left behind. Polar bears are constantly on the move. Food sources in the Arctic are unpredictable, which has lead polar bears to become one of nature’s most far-roaming land mammals. Scientists have recorded cases of bears wandering as far as 3,000 miles in the hunt for prey, though most bears stick to an area that measures a few hundred square miles. Polar bears subsist primarily on the ringed seal, and will venture great distances when local food is scarce. Male bears can go for up to four months without a large meal, and females have been known to fast for eight months during pregnancy and denning.